Last week, a local Street Fighter V event in Ontario, Canada saw 15-year-old “Toffee” take a major step in her competitive career as she sailed past a handful of her fellow competitors en route to tournament gold. 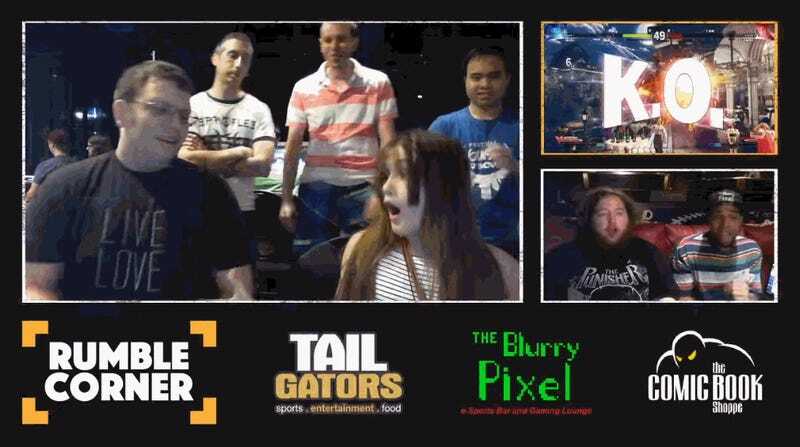 Her celebration, a pop-off that was more elation than disrespect, has spread across the fighting game community like wildfire. Rumble Corner, a tournament series organized in conjunction with Ottawa’s Grand Capital Smash, hosted its first event on June 24, drawing in a dozen competitors from the local area to compete in Street Fighter V. Toffee was in attendance, hoping to build on a string of prominent placings in both online and offline events, the fruits of a serious competitive drive that was established a little over a year ago. A couple of hours later, Toffee found herself in grand finals. Her opponent, Forest613, had sent Toffee to the losers bracket with a devastating 3-0 sweep in the winners finals, giving her the opportunity to exact revenge. What followed was an absolute nail-biter. Toffee, as the losers bracket finalist, had to take two best-of-five sets against Forest613 to win the tournament, both of which came down to the last round. But despite what she later called “mediocre play,” Toffee displayed poise that some competitors twice her age are still struggling to develop. Once it dawned on her that she had won, Toffee flashed a momentary look of surprise before shaking her opponent’s hand and jumping out her chair in celebration. Her joyous celebration was caught on the player cam, and quickly caught the attention of the greater fighting game community. Even world-class players like Justin Wong, Seon-woo “Infiltration” Lee, and Kun Xian Ho extended their congratulations to the young up-and-comer, but like any true competitor, Toffee still isn’t satisfied. While a number of older players can still throw down with the best of them, prodigies like Toffee have become a common sight in the fighting game community over the last few years. Capcom Cup’s reigning champion, Du “NuckleDu” Dang, also began playing fighting games at a high level when he was only a teenager, and has since become one of the world’s foremost Street Fighter V competitors. Similar to the unbalanced gender ratio in the community at large, however, these young players are typically boys. For her win, Toffee was awarded a small cash prize, which she used to purchase a milkshake and, of course, pay her mother back for the tournament entrance fees. She plans on attending both Red Bull Proving Grounds and Canada Cup later this year to see how far she’s come. At just 15 years old, Toffee’s future in the fighting game community is bright, even if her age can act as a hindrance.